It is a great book though. I really loved Shelley Coriell's previous book, Welcome Caller, This Is Chloe, so I did have pretty high expectations for this book and all of those expectations were met and in some cases exceeded! Plus, I find the cover of this book to be very eye-catching. What a gorgeous blue. Goodbye, Rebel Blue is the story of Rebecca (nickname: Rebel) who's a bit stand-offish and has an attitude and doesn't really connect with anyone in her life since her artist mother died and she was shipped off to leave with her aunt and uncle and her cousin, Penelope. Since then, she's shut herself off from everyone else. And all of that comes to a head when in detention Rebel meets a girl, Kennedy Green, who dies that same day. In order to atone for some of the guilt that Rebel feels for the way she treated Kennedy, Rebel decides to do all of the things on this dead girl's bucket list. And in doing so, comes to some very important realisations about herself, her friends, her family and what she needs as an individual. The whole bucket list was pretty fun. Each chapter begins with a kind of jokey bucket list that Rebel writes to pass the time. They're all pretty ridiculous and because of how silly they are, they made me smile with each chapter that I started. Kennedy Green's bucket list, however, is all about doing good for other people. Volunteering with the school's 100 club, daily acts of kindness, planting trees, adopting endangered animals, honouring her dead grandparents. And doing things on Kennedy's bucket list really pushes Rebel in ways that she hadn't been pushed. Rebel really starts off as being slightly unlikeable and brash. But I always really liked Rebel's character. There's a vulnerability in her and you can tell she really struggles to find a place where she fits in after losing her mother and the lifestyle that they had together. Finding a place to belong is something I strive for as well, so I felt really connected to Rebel in that way. I think what I like the most about Goodbye, Rebel Blue is how much Rebel changes over the course of the book not only in herself but also in her relationships with her family, her friend Macey and with Nate, the popular do-gooder that she slowly falls for. I loved Rebel for putting herself out there in these relationships. Rebel also has some great ideas about fear and truth which seem to go hand-in-hand. 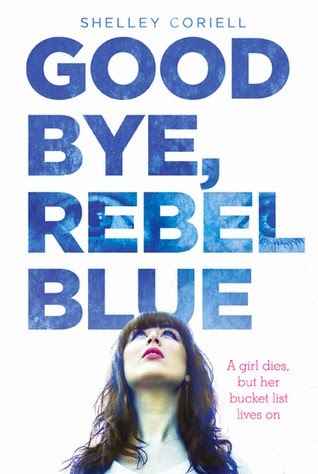 Goodbye, Rebel Blue is filled with pie and turtles and shark teeth and blue hair dye ... but it's also filled with great characters, kindnesses, truth and identity. Someone remarks in the book that certain people come into our lives at certain times because of destiny and sometimes books do too. Ooh, this book sounds really good. I like how you talked about it making you ponder what's important in life because that can be difficult to discern. I think we can all get a bit confused about what we want out of life, and any book that can help us decide is worth a try. It's also great when the author makes little things like turtles and shark teeth important to the plot. It makes me want to read the book just to find out where they fit in. You're welcome, Emily. This was definitely a great book for making me think! Sorry, that was supposed to say Clover! I write 'Cliver' all the time too! YW, I really recommend that you do look out for this one! This sounds gorgeous. I love the idea of someone living out someone else's bucket list as, sadly, I can't imagine it's something many people get to do. I really liked the premise of the book too and it is definitely a gorgeous book..